About "Free Book (Study Guide)"
"I am a fanatic about freedom. And I'm fanatical about coming at you hard in this book." Maybeyou're not as free as you think you are. Even worse, you may have beenduped into believing that a "balanced" life is the key to happiness (itisn't) or that a relationship with God is about layering on rules andrestrictions (nope). Whether it's media-fueled fear, something aparent or teacher said that you just can't shake, or even the realityof dark spiritual forces bent on keeping you down, something is holdingyou back from the full-on freedom God intends for you. The Biblesays, "Where the Spirit of the Lord is, there is freedom." Not fear.Not guilt. Not morality. Freedom. You can have the sort of joy youthought only kids could have. The day of freedom is here. This isn?t your typical workbook. It's not homework. It's not one-size-fits-all. 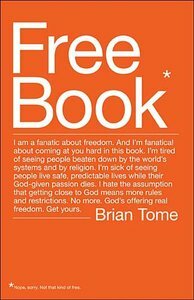 This companion guide to Brian Tome's Free Book is an interactive tool designed to help you discover what's holding you back from the free, full life God intends for you. What you choose to do about that thing is up to you. But know this: God really wants you to be free, and he's got more than enough power to make it happen. He wants you to experience the kind of freedom and joy you thought only kids could have. But simply reading a book about freedom won?t make you free?beginning and continuing the journey is up to you.